AUTO: When this Unit is placed on (RC) from the hand, look at the top 7 cards of your Deck, reveal up to 1 “Tirua” card, add it to your hand, shuffle your Deck,. If you add 1, choose 1 or more cards from your hand whose Grades equal 3 or more, then discard it. AUTO (RC): [SB1 & Place this card on the bottom of the Deck] When your turn ends, if you have a “Tirua” Vanguard, you can pay the cost. If you pay it, Counter Charge 1. 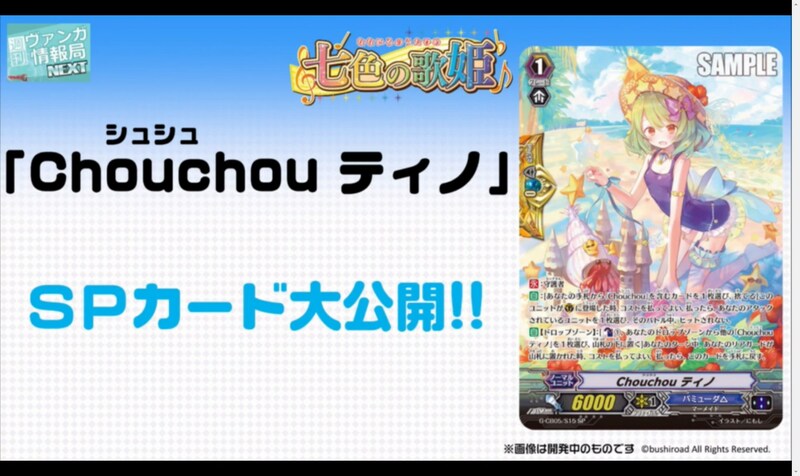 AUTO (RC) GB1: [Counter Blast 1 & Place this card on the bottom of your Deck] When another of your “Chouchou” Rear-guards is returned to the Deck, you can pay the cost. If you pay it, draw 1 card, then choose up to 1 “Chouchou” card from your hand, Call it to an (RC), during that turn, it gains Power+3000. AUTO: [Choose 1 “Chouchou” card from your hand, Discard it] When this Unit is placed on (GC), you can pay the cost. If you pay it, choose 1 of your Units being attacked, during that battle, it is not Hit. AUTO [Drop Zone]: [CB1 & Choose 1 of your other “Chouchou, Tino” from your Drop Zone, place it on the bottom of the Deck] During your turn, when your Rear-guard is placed on the bottom of your Deck, you can pay the cost. If you pay it, return this card to the hand. Dragheart, Luard awakens as a Dragon Emperor! As well, many new Battle Sisters are included. A new “Dragonic Vanquisher” appears! Thunderstrike gets a huge buff! And new cards will make it even easier to achieve the conditions for Thunderstrike! Popular Decks such as “Gear Chronicle”, “Nubatama” and “Neo Nectar” get huge shots in the arm, making them even stronger! “Dragheart, Luard” now “awakens” as the “Dragon Emperor”! !